Good Time Charters > Captain’s Blog > Uncategorized > Are manatees near Fort Myers Beach yet? Are manatees near Fort Myers Beach yet? 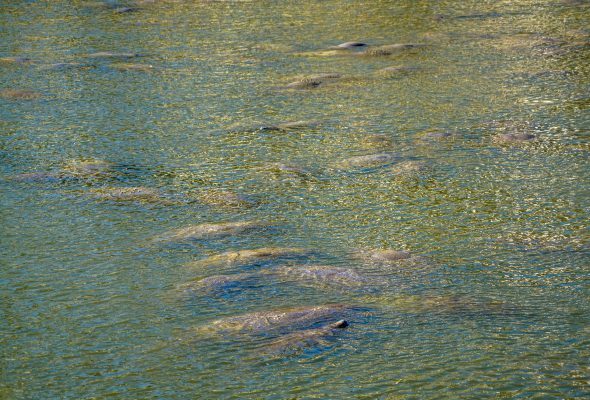 Manatee Migration: They’re On The Move! Florida’s most famous gentle giant, the Florida Manatee, is on the move! Colder temperatures like those we experience in January and February on Fort Myers Beach bring these creatures out of their normal routine and into shallower, warm waters all across Southwest Florida, including Fort Myers Beach. Manatees are susceptible to cold-related diseases, and in the winter, tend to gather near warm water sources above 68 degrees. Because these creatures move into our slow-moving rivers, bays, estuaries and coastal waterways during this time of the year, guests on our tours are provided greater opportunities to spot these beautiful creatures in the wild. Manatees, also known as sea cows, have been in existence for a very long time. Manatees are believed to have evolved from four-legged land mammals existing over 60 million years ago. There are currently three living species of Manatees in the order Sirenia. As Florida’s official marine mammal, these animals are a large aquatic relative of the elephant. Manatees are grayish brown in color and have thick, wrinkle-like skin covered in algae. Their front flippers help them steer, or sometimes crawl, through shallow water. They also have powerful, flat tails that help propel them through the water. Though their eyes are small and they lack outer ears, manatees can see and hear very well. As herbivores, Manatees ingest a diet of mostly vegetation and sea grass. Florida Manatees may have been removed from the Endangered Species List in 2017, but that doesn’t mean that these creatures are completely safe. Although there is no precise count of the number of today’s manatees in Florida, it is estimated that approximately 6,000 currently live in Florida. Known for their gentle, slow-moving personality, manatees will barrel roll body surf when playing. Manatees generally rest and feed often and they communicate by making squealing noises under the water to show fear, stress or excitement. Experience manatees first hand on one of our many tours. Though we can’t always anticipate when and where these creatures will pop up, any of our boat, cruise, or kayak tours on Fort Myers Beach may lead to an unpredictable encounter with one of Florida’s most beloved animals. Learn more about all the tours and cruises we offer on our tour webpage located here.